How cute is this! 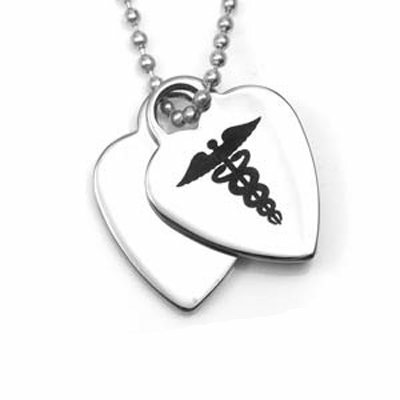 Our Double Heart Medical ID Necklace offers two 316 surgical stainless steel heart charms, one with the Wings of Aesculapius caduceus staff universally known as the medical alert symbol and includes 24" 304 stainless steel ball chain. We laser engrave your emergency or medical contact information to keep you safe & stylish. Charm has a polished finish. Product not eligible for further discounts. Price includes two stainelss steel medical alert hearts with FREE Black laser engraving and 24" stianless bead chain, easily cut to desired length.